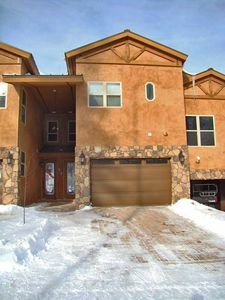 Well established family owned Ski in/Ski out with 5/5 STAR VRBO ratings. Furniture is top of the line with leather couches and clean new mattresses. 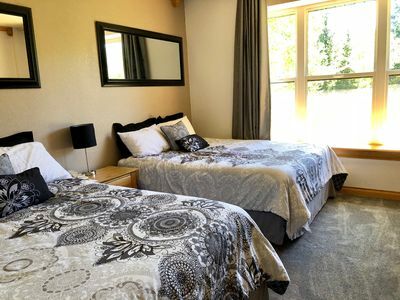 Each room is fully furnished with dressers, upgraded new UHD SMART TVs (HD Dish Service throughout house), high speed internet, and plenty of room with the added touch of themed interior decorations. All bathrooms and kitchen have brand new hardwood floors and there is new carpet throughout. 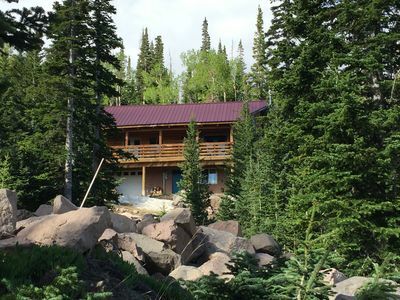 Our cabin is located right next to Navajo ski run called "Paradise run" which is 40 to 50 yards out the back door. Please be advised, during heavy snow fall periods, ski in/ ski out may require increased effort that may not be suitable for everyone. There is a moderate incline as you return to the cabin which our posted pictures provide excellent visual perspective. 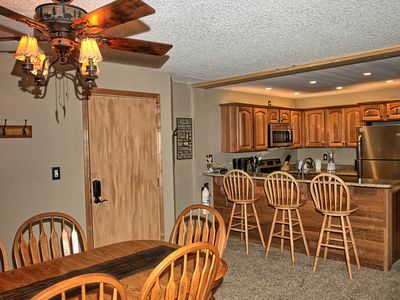 New appliances in kitchen with fully stocked amenities to meet all your cooking needs. Large dining room table and kitchen bar will accommodate all guests in one sitting while providing INCREDIBLE aerial views of Giant Steps. 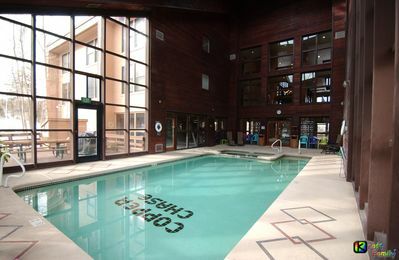 The ground level two car GARAGE IS HEATED and is fully equipped with table tennis, foosball, and brand new 2-person full-sized cocktail table arcade game with over 60 classic games for the entire family to enjoy. A multiple boot and glove dryer is included to ensure your ski wear is comfortable every day you ski. Three snow sleds are also available for hours of fun in the snow. 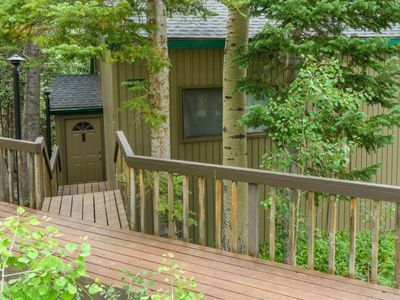 First level of the cabin has a master suite with huge bathroom and private deck with Amazing views of Giant Steps. 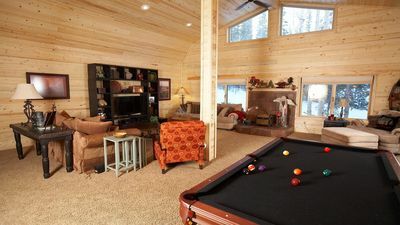 The second level of the cabin has the large master suite which has a private balcony and spacious bathroom. 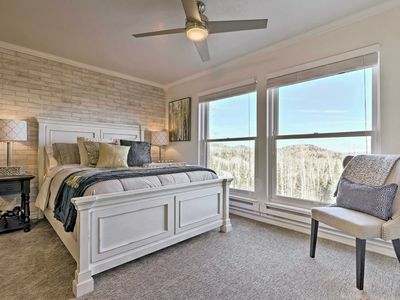 The second bedroom is a full-sized junior master suite with a private bathroom. 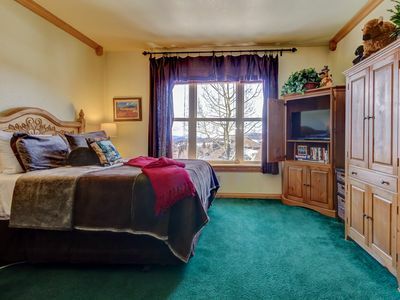 Each room is professionally decorated with a mountain theme to add to the ambiance. 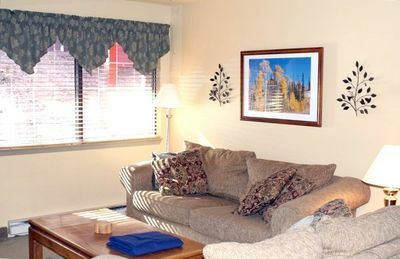 Both rooms have brand new UHD SMART LCD TVs for your private enjoyment. Additionally there is a laundry room with brand new extra capacity washer and dryer. Laundry soap is included. 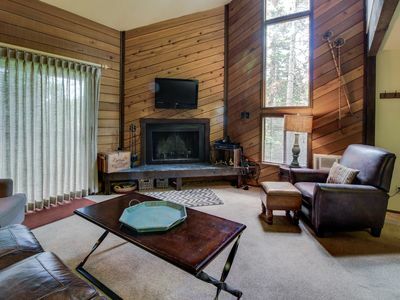 The next level up has the spacious living and dining areas with a large center piece fireplace. 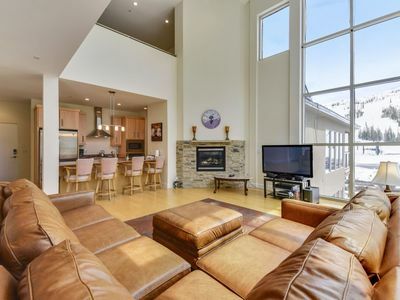 It is highlighted with windows that provide a breathtaking view of the entire Giant Steps side of Brian Head Ski Resort. There is a large bathroom and shower on this level next to the full-service kitchen. Enjoy a brand new 55-inch UHD SMART LCD TV with 5.1 surround sound. New Queen sized sleeper sofa sleeps 2 adults comfortably on luxurious memory foam mattress. 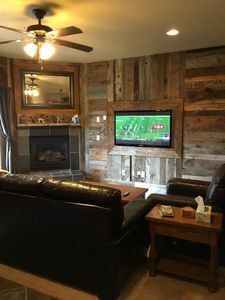 You can use APPS to link your cell phone to both the TV and sound system to display your highlights of the day while listening to your favorite music. 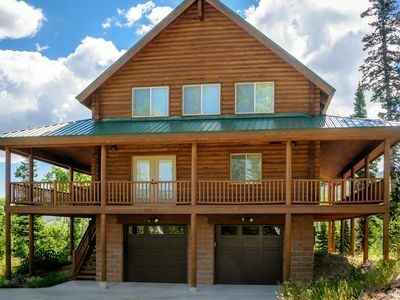 The top level of the home has a loft that will sleep 3 guests and a third bedroom that sleeps 4-5 guests. 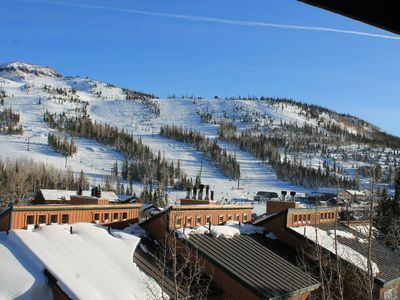 Both areas boast amazing views of both Navajo and Giant Steps ski slopes. 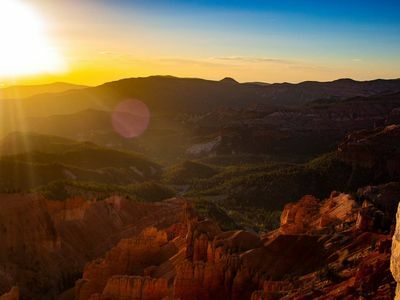 This is a one of a kind view in ALL of Brian Head. The room also contains a newly installed 32-inch UHD SMART TV. Spacious parking will accommodate trailer, boats, ATVs and multiple cars for larger groups. Owner provides the following: Clean linen and towels, laundry soap, hand soap, dishwasher soap, kitchen napkins, paper towels, dish soap, toilet paper and trash bags. Unlimited WIFI and HD Dish satellite TV service. 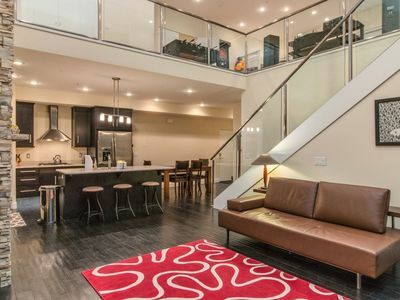 Fully RENOVATED & TRULY Ski-in/Out 1st Floor Unit! Best Location! 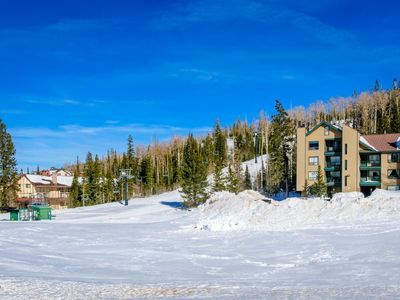 Dog-friendly condo with ski-in/ski-out access to Navajo - great for families! 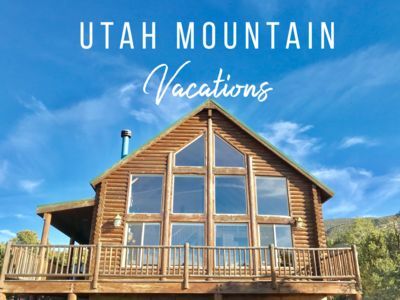 Two Large Mountain Cabins - on one forested acre!